The classrooms for children between the ages of 2 ½ and 6 years are carefully prepared learning environments, filled with concrete, manipulative Montessori activities, which encourage children to learn and discover individually, at their own pace. Dr Montessori believed that children in this period of their lives had “absorbent minds;” that they could take in impressions and information from the environment just as a sponge soaks up water. 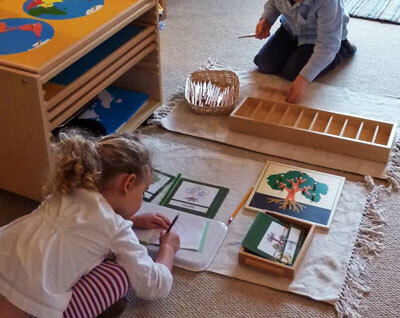 Montessori teachers learn to carefully observe each child, watching to see what they are most interested in and to then connect them with the activities which will support this interest. Because the child is encouraged to follow their interests they quickly become focused, engaged and demonstrate a joyful love of learning. 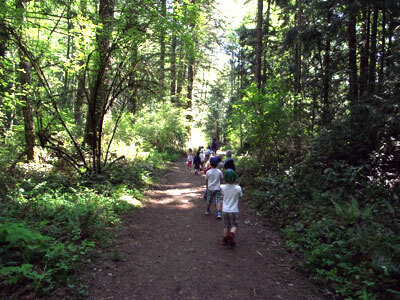 Initially children in both the Cedar and the Arbutus rooms at Shawnigan Lake Montessori are shown activities in the Practical life area. 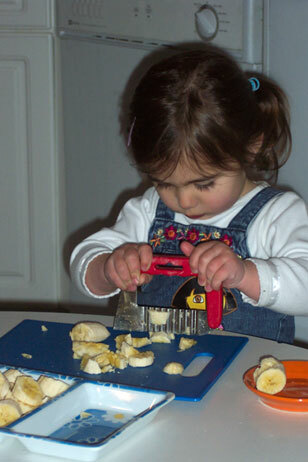 These activities mirror much of what the child will have seen at home; they will learn how to pour, in order to help themselves to drinks from the snack shelf, to wipe tables as they take care of spills, to sweep and tidy up when the grains of rice or beans they are pouring fall on the floor etc. 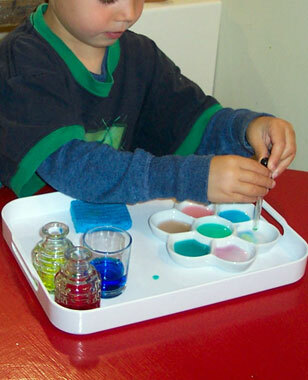 Here they can also practice art and craft skills; cutting, gluing, painting and sewing. The children also learn how to care for the living things in and around the school; to plant seeds and bulbs, grow vegetables, to water and care for the classroom plants, to feed the goldfish and wild birds. The children learn through experience how to be kind and gentle and to respect all living things. The children’s experience of respect is expanded as they learn how to solve their conflicts with one another, how to act politely and how to help one another. The multi age classroom allows younger children to have role models as the older children become mentors and guides. The teachers support and gently help this process, demonstrating with love and respect how to create a peaceful and cooperative environment. As the children progress in experience, they can experiment with sensorial materials that educate their visual, auditory and tactile senses. 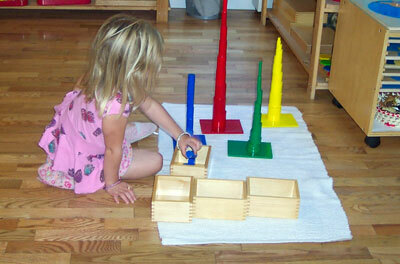 They can play vocabulary sound games, sing and listen to stories. 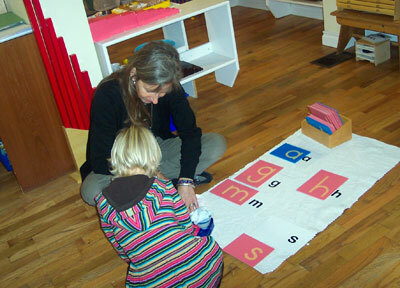 Once the child is ready and interested, phonetic sounds and letter symbols can be introduced. 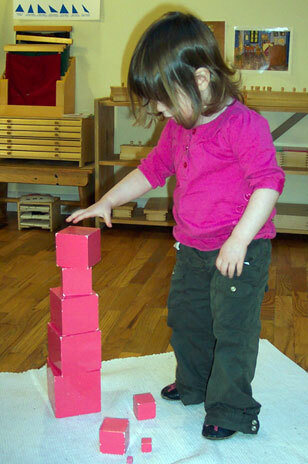 The child progresses at their own pace through a stepped language program, as they learn how to read and write. 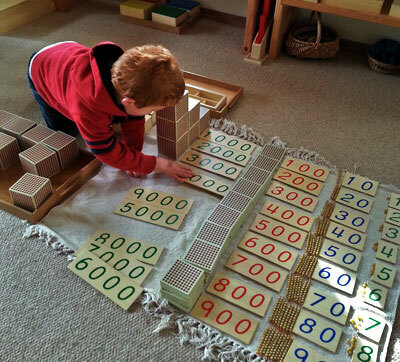 Numbers are introduced in concrete, hands on ways with manipulative materials which enable the child to make connections and to see patterns in the activities used. All of this the child learns at their own pace and in their own time, moving from understanding quantities and symbols from 1 to 10 and then through the decimal system. 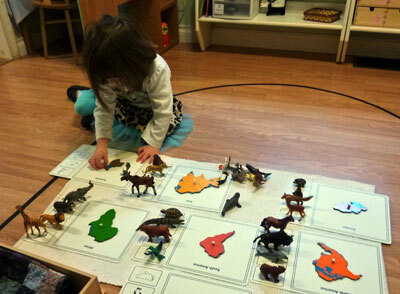 The world around is brought into the classroom through the Montessori cultural materials which introduce the child to geography, history, science and biology. The children have the opportunity to learn from globes and maps about the continents, oceans and the people and animals that live all over the Earth. 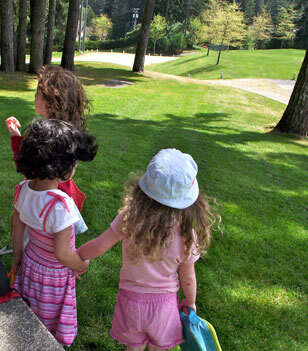 The children have time to play in the garden each day and to go for walks in the grounds of Shawnigan Lake School. Regular opportunities to explore their immediate surrounding world, helps to enhance a child’s natural sense of awe and wonder. Please review the enrollment page and set up a school visittoday. Set up a school visit now! 250 743 6279 For more information view our Enrollment page. Shawnigan Lake Montessori never fails to put a smile on my precious boy's face. Lovingly and passionately, Nicky and Leanne prepare my son's growing mind for the next step in his life. Every day he is encouraged and guided to embrace his independence, to explore his creativity, and to learn generosity and kindness. I am delighted my little boy has the opportunity to attend Shawnigan Lake Montessori and to be nurtured by Nicky and Leanne's unfailing friendliness, their seasonal imagination, and their ongoing passion for developing young minds. My family and I are forever grateful to Nicky, who is the first teacher to both our daughters at Shawnigan Lake Montessori. Nicky is a blessing and has instilled both confidence and a passion to learn in our children. We attribute Grace, our daughter’s focus, dedication, and success in Kindergarten and Grade 1 because of her early start with Nicky. Being a reserved and sensitive child, Nicky took Grace under her wing. A kind, gentle and patient approach is combined with Nicky’s wealth of knowledge and competence with children. She has a gift to see each child individually, each with their own unique strengths and personalities. Her love and dedication are something that we - as parents - are eternally grateful for. The teachings she imparts on our children are values that will stick with them as they progress through life. There is going to be a lot of sadness this June when our second and last child graduates from SLM! We feel incredibly blessed that our son has had the opportunity to attend Shawnigan Lake Montessori Preschool. His positive transformation as a young learner has been amazing under the care of head teacher Nicky Constantine-Macdonald and early childhood educator Leanne Pachet. After having a difficult year at a previous Montessori preschool, he was guarded and apprehensive; rarely participating in group activities, and uncertain of whether he could open up and be himself in a school environment. After a year in Nikki’s classroom our son has emerged confident, articulate, enthusiastic, and purposeful. As parents it is a tremendous relief to know that your child is not only enjoying school but thriving in a learning environment that is that is nurturing, kind, stable, respectful, and inclusive. Nikki has the rare gift of tuning in to each child’s individual nature, witnessing their unique gifts, and supporting the highest development and expression of these gifts. Leanne has a wonderful ability to uphold a calm and peaceful learning environment while encouraging accountability and self-reliance in children. We are eternally grateful that our child had the opportunity to spend a formative year under the care and mentorship of Nikki and Leanne. We unreservedly provided our highest recommendation to any parent seeking an authentic Montessori school environment, staffed by these dedicated and talented educators. What a fabulous program. My Grandson cannot wait to get to his class. Even while he visited another excellent care program he told everyone, "My teachers are Nicky and Leanne." These awesome ladies are changing my grandson's life for the better.